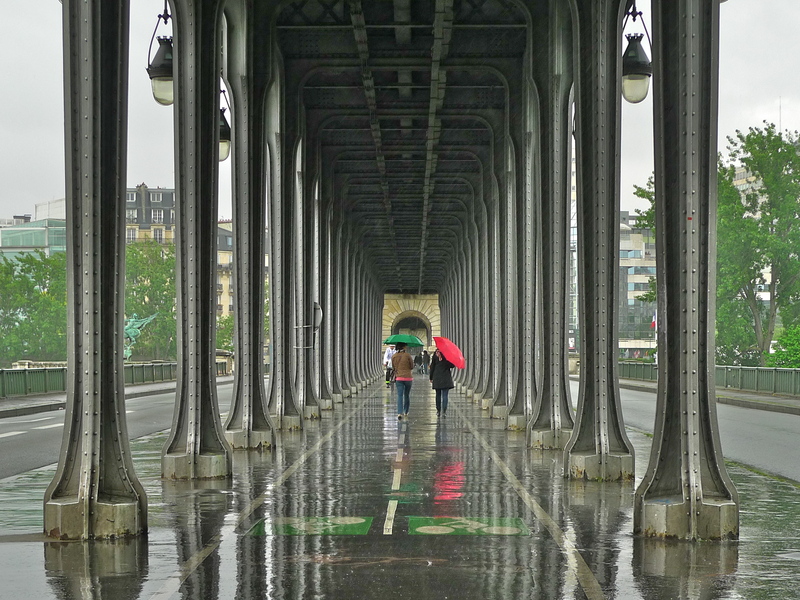 MORE RESEARCH FOR my Paris Bridges project took me recently to one of the iconic bridges that cross la Seine within the Paris city limits, the Pont de Bir-Hakeim. 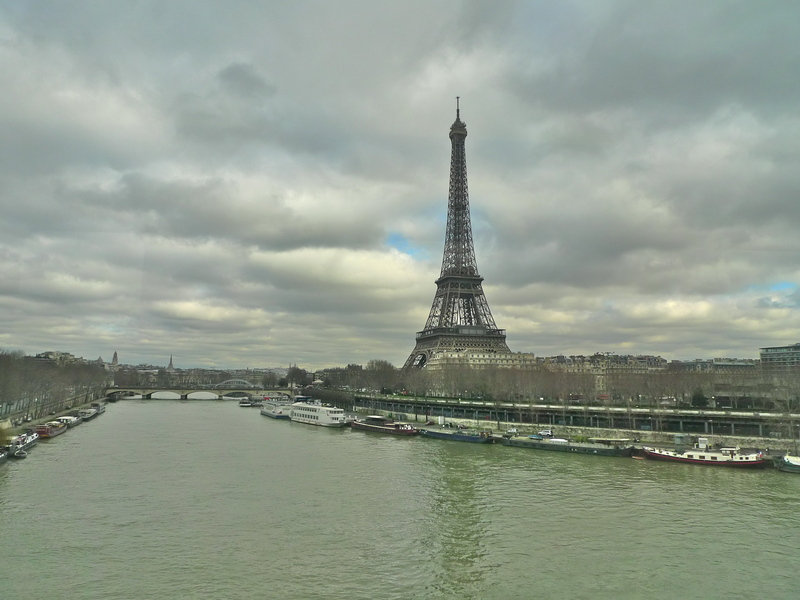 Linking the 15th and 16th arrondissements and crossing the artificial island, the Île aux Cygnes in the middle of la Seine, the Pont de Bir-Hakeim crosses the river just downstream from the Tour Eiffel. 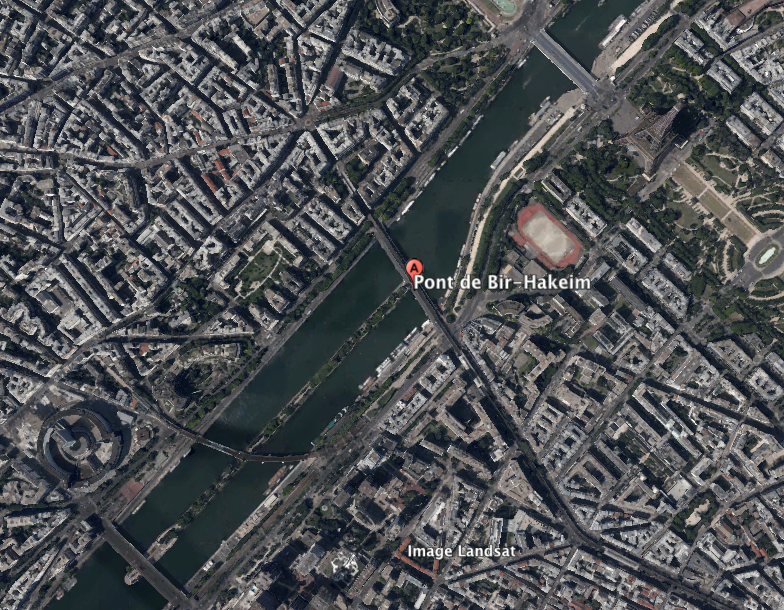 The Pont de Bir-Hakeim we see today is the second bridge to cross la Seine at this point. 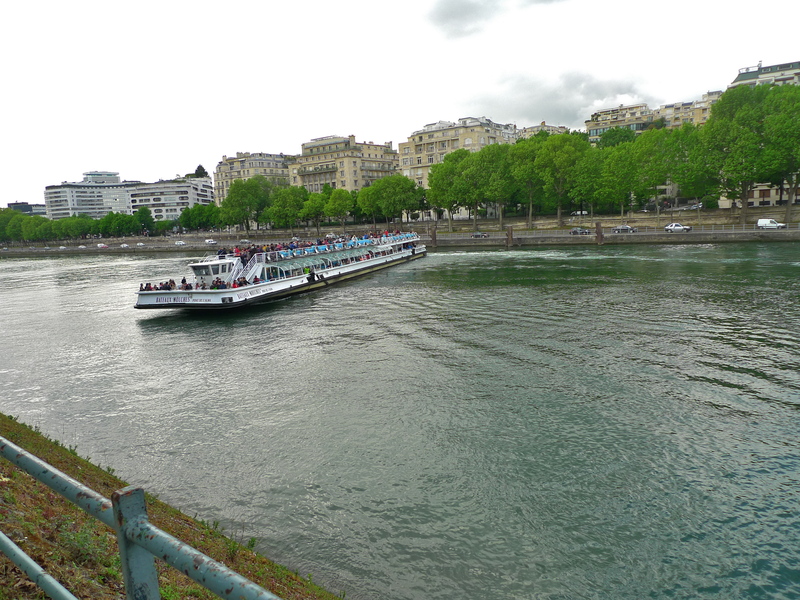 The first was a metal footbridge, the Passerelle de Passy, which was built for the 1878 Universal Exposition. 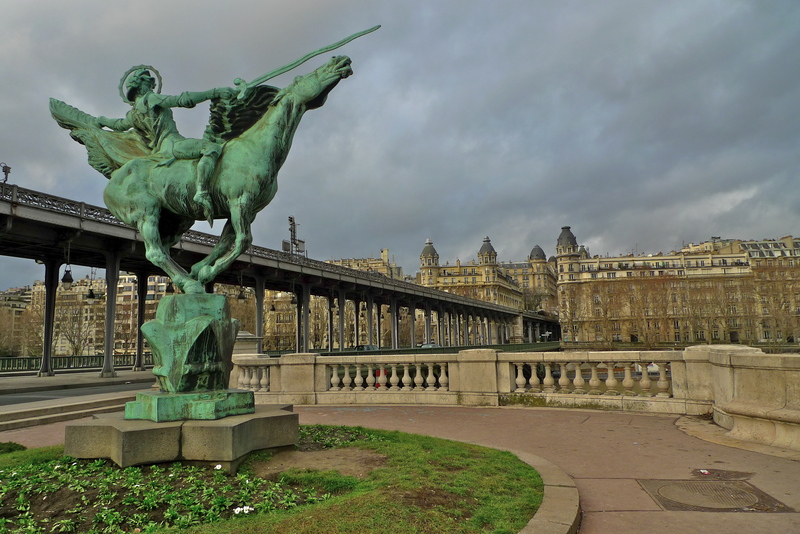 When Paris hosted the Universal Exposition in 1900 it was decided to draw up plans to replace the existing footbridge with something more substantial. In 1902, the Métropolitan railway and the Seine Navigation department organised a competition for a two-tier bridge, with a road bridge on the lower level comprising two lateral roadways separated by a central walkway and, on the upper level, a Métropolitan railway viaduct supported by metal columns resting on the central space. A proposal by the French engineer, Louis Biette, was accepted and the firm, Daydé & Pillé, were charged with constructing the new bridge. Construction work began in 1903 and was completed in 1905. The new bridge, the bridge we see today, was called the Viaduc de Passy, reflecting the name of both the original footbridge and the commune of Passy which is located at the Right Bank end of the bridge. The Pont de Bir-Hakeim comprises two unequal metal structures, each comprising three cantilever spans separated by a monumental stone structure on the upstream tip of the Île aux Cygnes. The larger of the two structures connects to the Right Bank and its arches measure 30 metres, 54 metres and 30 metres and for the smaller structure connecting to the Left bank, the arches measure 24 metres, 42 metres and 24 metres. The two structures are anchored by an abutment at each end and by a common abutment on the Île aux Cygnes. The lower level of the bridge comprises two roadways each 6 metres wide, two pavements each 2 metres wide and a central walkway 8.7 metres wide, which also doubles up as two cycle lanes. The total length of the bridge is 237 metres. 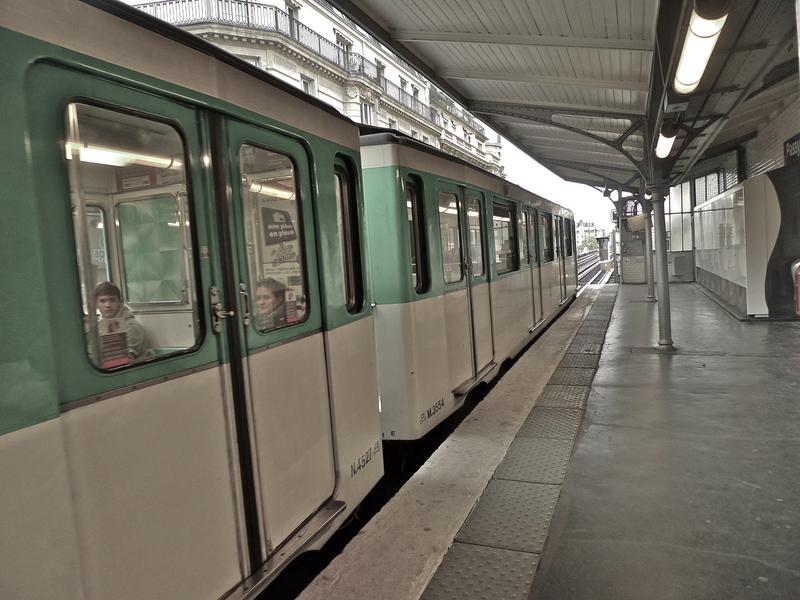 The upper deck carrying Métro Line 6 comprises a metal deck supported by cast-iron pillars 6 metres apart. The upper deck is 7.3 metres wide. 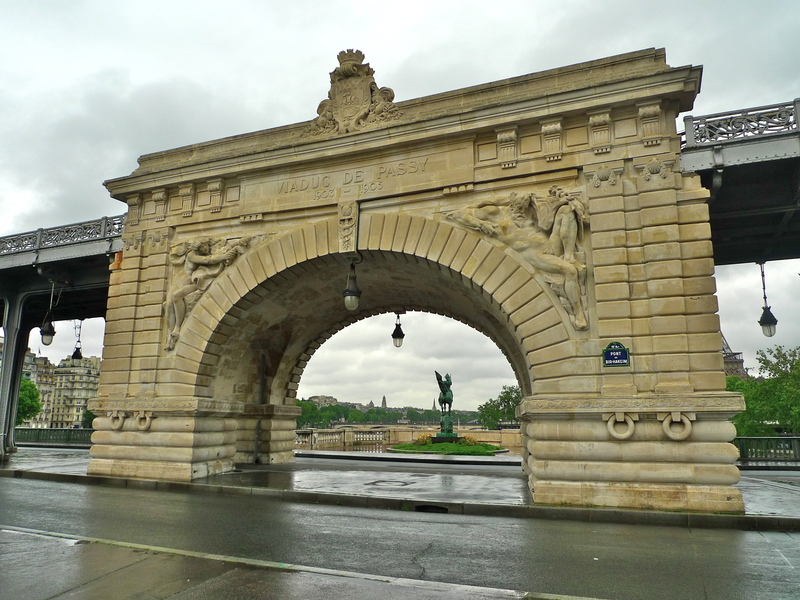 A Paris municipal architect, Jean Camille Formigé, was responsible for the decoration of the bridge. 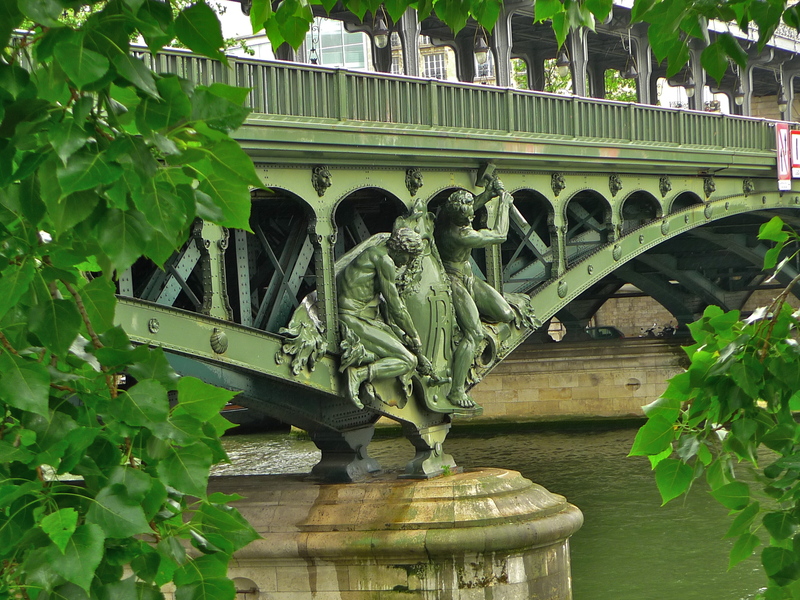 He engaged three sculptors, Gustave Michel, Jules-Felix Coutan, and Jean Antoine Injalbert to create sculptures to adorn the bridge. The bridge retained the name ‘Viaduc de Passy’ until 1948 when it was renamed to commemorate the Battle of Bir Hakeim, fought by Free French forces against the German Afrika Korps in 1942. My Paris Bridges project is not only about exploring the history of each of the thirty-seven bridges that cross la Seine within the Paris city limits, it’s also about exploring the characteristic sounds of each bridge. Since one of the characteristic features of the Pont de Bir-Hakeim is the viaduct carrying Métro Line 6 on the upper level of the bridge, the sounds of Métro trains crossing the viaduct are clearly one of the characteristic sounds of the bridge and so I went to investigate. 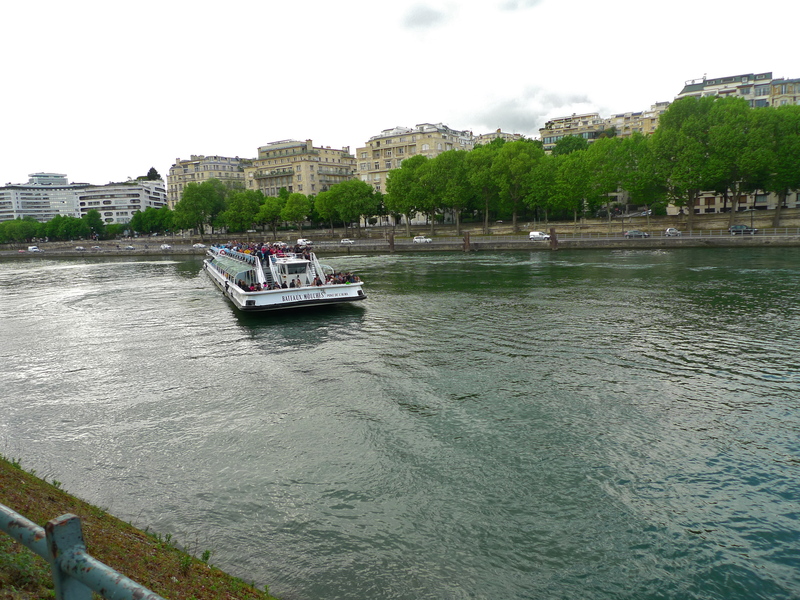 My exploration began at the Métro station Passy at the Right Bank end of the bridge from where I caught a Métro train and made the short journey across the bridge to the next station, Bir-Hakeim. 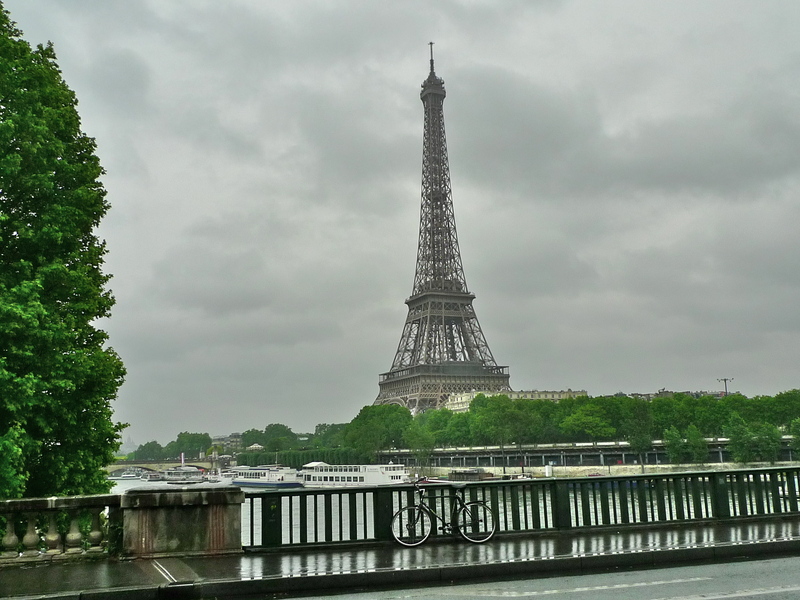 Another characteristic feature of the Pont de Bir-Hakeim is the spectacular view of the Tour Eiffel from the bridge and especially from a Métro train crossing the viaduct. Even on the dullest of days the view is quite special. And when standing on the bridge the view is equally impressive. 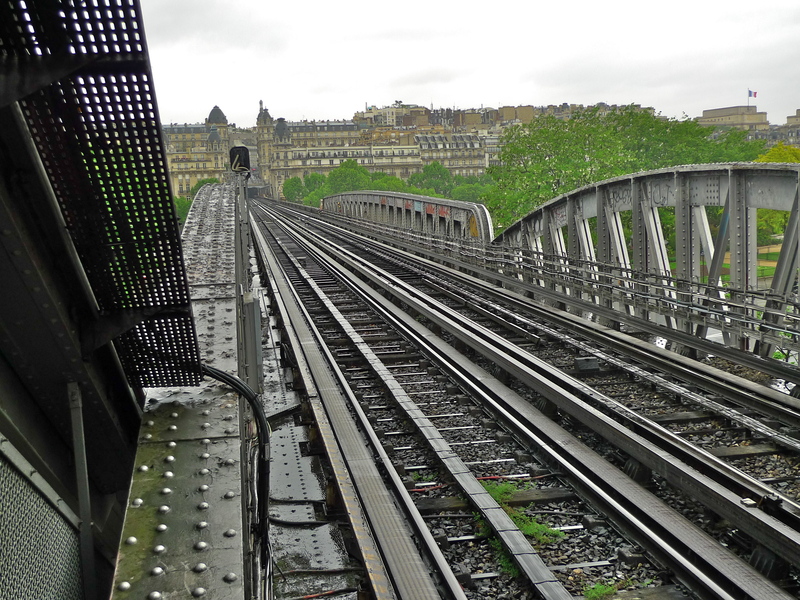 Having crossed the viaduct I alighted at Bir-Hakeim station from where I could get an excellent view of the Métro line crossing the viaduct. Next, I wanted to explore the sounds on the lower level of the bridge. I walked across the bridge on the central walkway underneath the viaduct from the Right Bank to the Left Bank listening carefully to the sounds around me. I then walked back in the opposite direction this time not only pausing to listen but also to record. 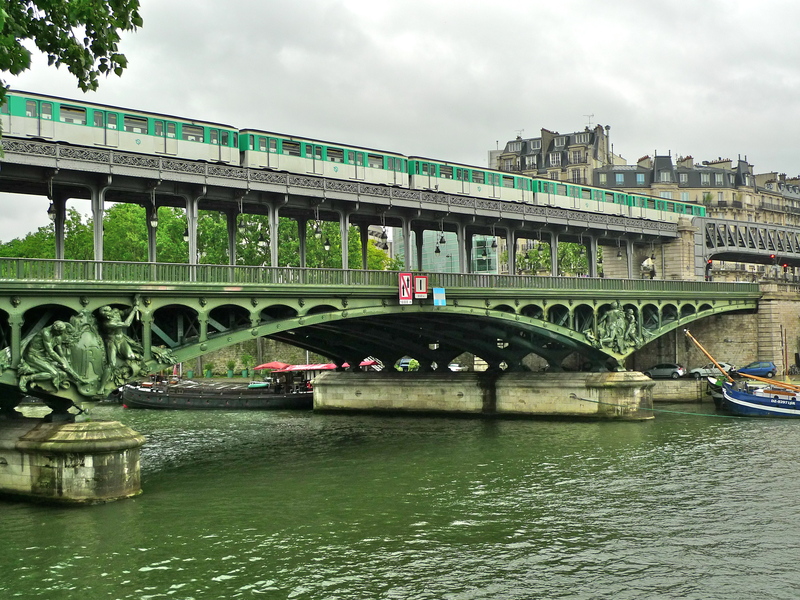 I discovered two characteristic sounds on the bridge – the sounds of the Métro passing overhead and of course, the sounds of the passing traffic. I found the sounds of the traffic to be different here to that found on some of the other Parisian bridges. Traffic lights at both ends of the bridge regulate the flow and so the traffic passes in waves rather than in a constant stream and the bridge is also long enough to avoid endless queues of traffic backing up across the bridge, at least for most of the time. In addition, the very smooth road surface together with the large expanse of open space either side of the bridge along its length seems to help dampen the more aggressive sounds of the traffic. The sounds of the Métro passing overhead were interesting. 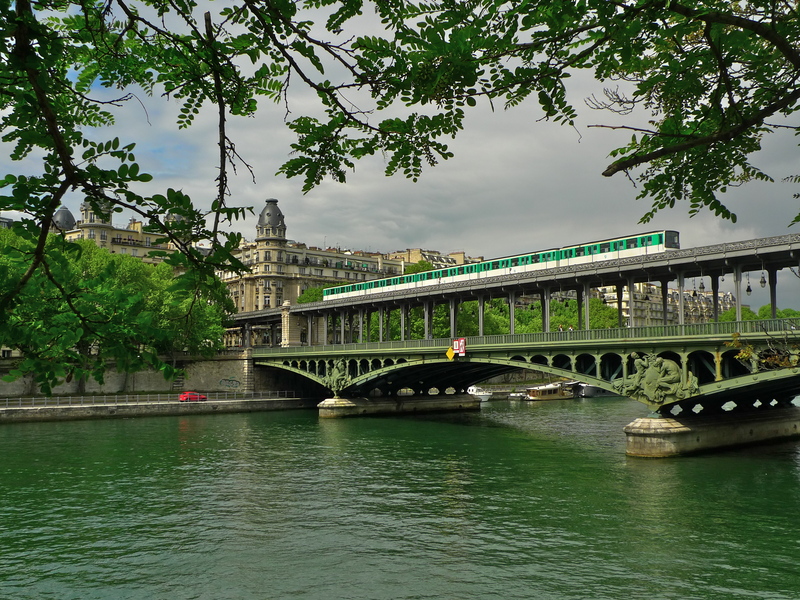 As the Métro line approaches the stations at either end of the bridge, Passy on one side and Bir-Hakeim on the other, the sounds of the trains passing over the viaduct are much clearer than they are around the centre of the bridge. The reason for this could be that there are buildings close to both ends of the bridge that reflect and thus amplify the sounds whereas the expanse of open space on either side of the bridge in the centre helps to dissipate the sounds. As well as recording the sounds of the traffic and the Métro crossing the bridge, both of which are clearly characteristic sounds of the bridge, I was eager to see if I could find any sounds that might be unique to the bridge. On the hunt for any such sounds I walked back and forth across the bridge several times and even went under the bridge but, after much very careful listening, none of the sounds I heard seemed to strike me as being unique to this bridge. After all, this is not the only Parisian bridge to carry a roadway with traffic and a viaduct for the Métro. 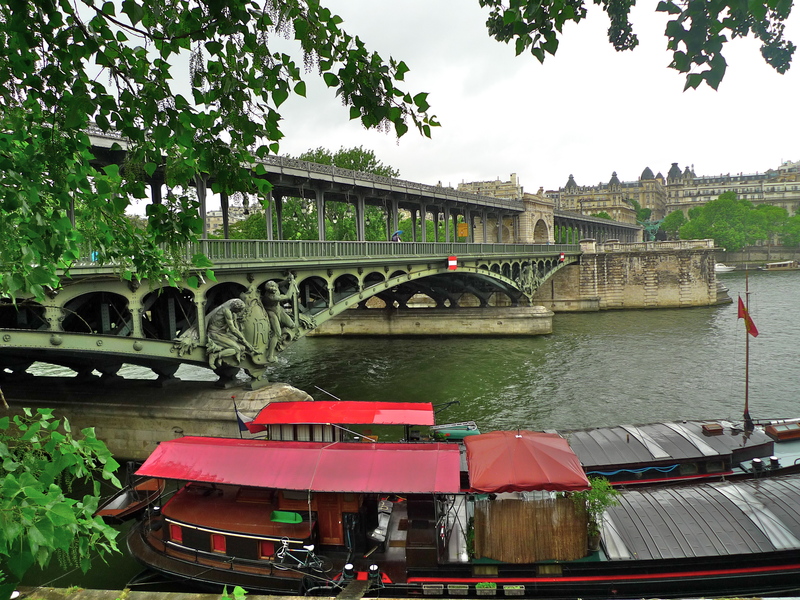 As part of my Paris Bridges project I published a piece on this blog some time ago about the Pont de Bercy, which although made of stone, is functionally similar to the Pont de Bir-Hakeim. 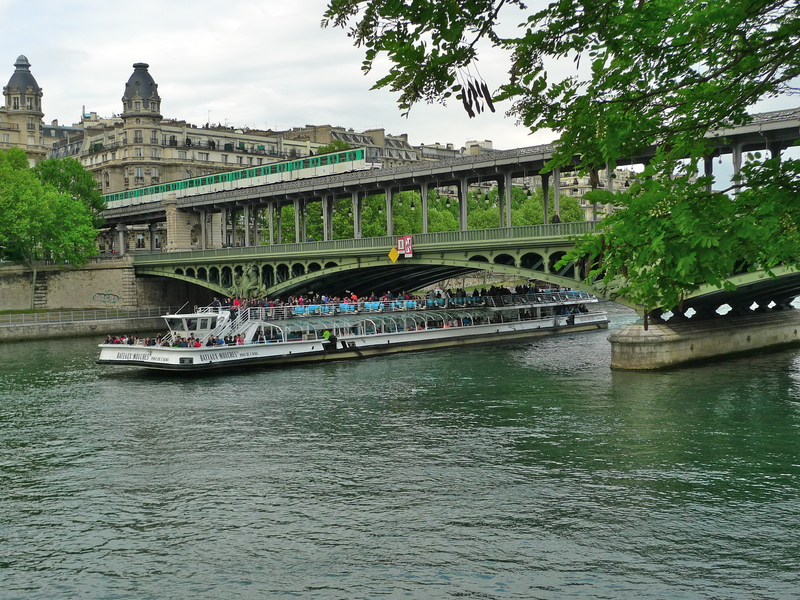 While the sounds of the traffic and the sounds of the Métro are characteristic sounds of both these bridges I wanted to see if there was any sound on or around the Pont de Bir-Hakeim that would distinguish it from its upstream cousin. My experience of hunting for sounds in the urban environment has taught me that patience is a virtue and that if you search hard enough and wait long enough something almost always turns up. Seeking somewhere to sit down after all the walking I’d done, I ventured down the steps beside the bridge to the Allée des Cygnes, the pathway that runs along the length of the Île aux Cygnes. A bench hove into view and I sat down and pondered where I might go next to search out the sounds I was seeking. I sat there for almost twenty minutes before I decided that it was time to get up and leave. And then, quite suddenly, I found that I didn’t have to go and search for more sounds after all — instead, the sounds were coming to me! Emerging from under the Pont de Bir-Hakeim from the upstream side was a Bateaux Mouches, the largest of the tourist boats to ply la Seine. 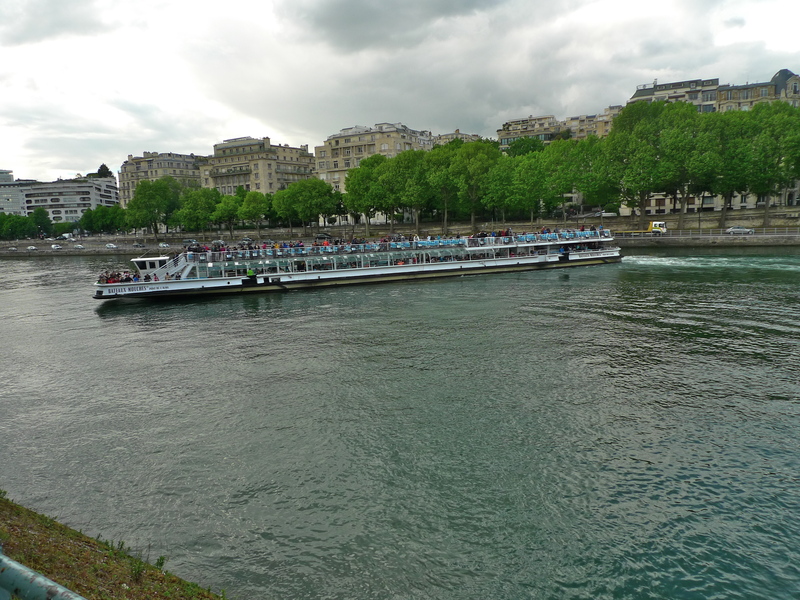 Tourist boats ply la Seine all the time and the sound of them passing under the bridges is quite normal and hardly unique – or is it? Well, the sounds of the Bateaux Mouches passing under the Pont de Bir-Hakeim are, believe it or not, unique to this bridge. But why should that be? 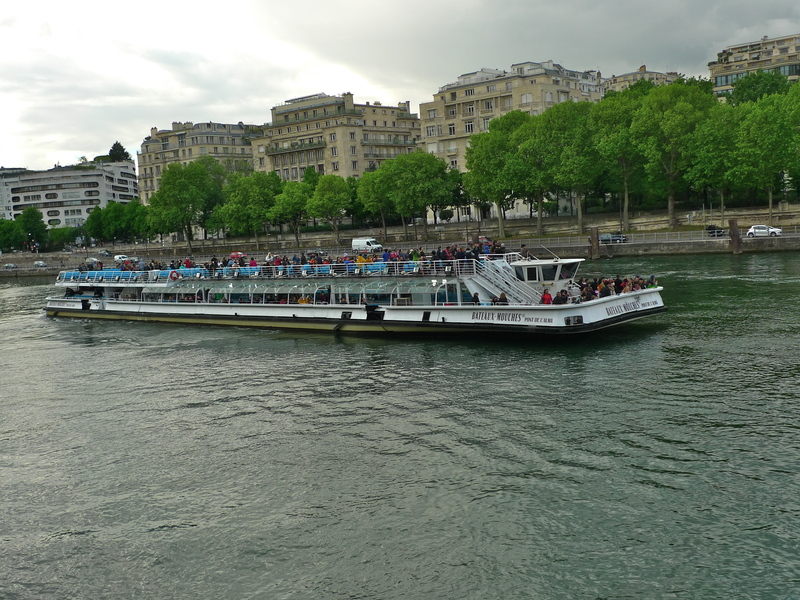 The answer is that the route for most of the tourist boats, irrespective of where they start their journey, stretches from the upstream Pont de Sully to the downstream Pont de Bir-Hakeim. Both these bridges are used as turning points for the tourist boats. 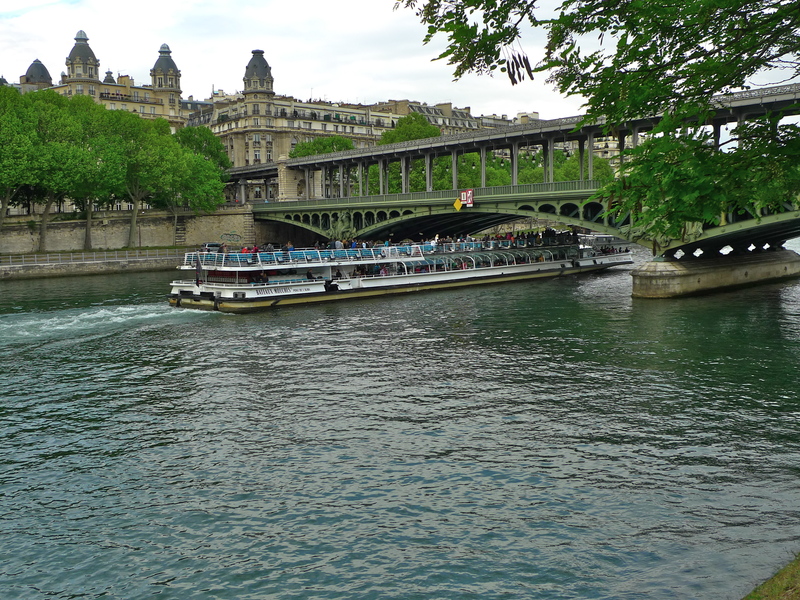 At the Pont de Sully, the boats travel quite a long way beyond the bridge before turning round whereas at the Pont de Bir-Hakeim they all, save for the Bateaux Mouches, turn round on the upstream side of the bridge without passing under it. 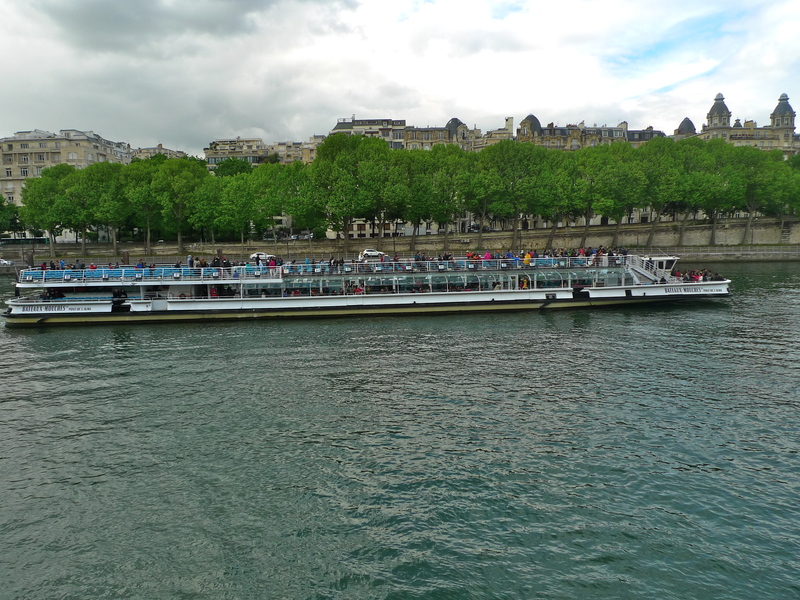 The Bateaux Mouches on the other hand does pass under the Pont de Bir-Hakeim, but only just, before turning round and passing through it again in the opposite direction. It is the sounds of this nautical ballet as the Bateaux Mouches turns round almost within its own length just beyond the bridge that I contend are the unique sounds of the Pont de Bir-Hakeim. Some might argue that the sounds of the Bateaux Mouches turning at the Pont de Bir-Hakeim are not unique to this bridge because the sounds of it turning upstream at the Pont de Sully might be the same, or at least similar. I would counter that by saying that at the Pont de Sully the Bateaux Mouches turns so far beyond the bridge that its sounds cannot be heard or, given a favourable wind, can barely be heard from that bridge. I know that because I’ve been to find out. 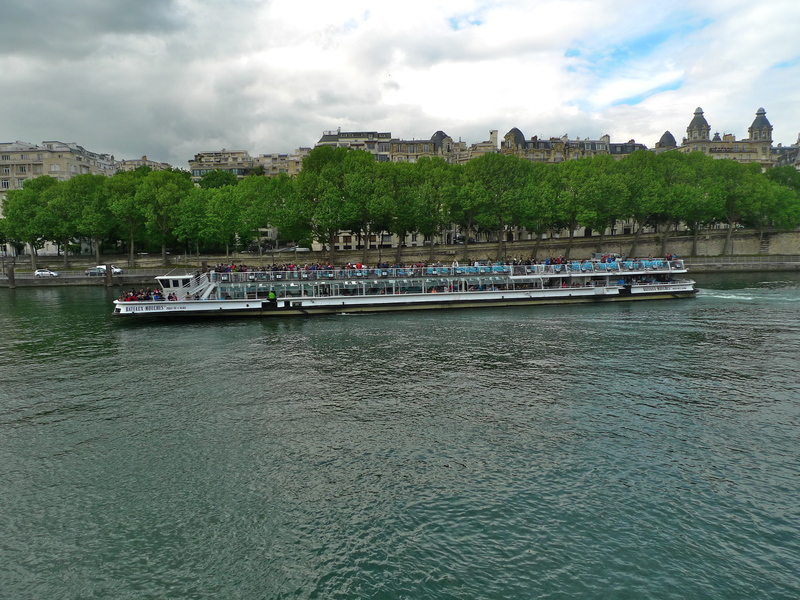 In any event, if you listen to the sound piece carefully you will hear towards the end of the piece the sounds of the Bateaux Mouches completing its turn accompanied by the sounds of a Métro train passing over the viaduct on the Pont de Bir-Hakeim. That confluence of sounds doesn’t happen anywhere else in Paris! 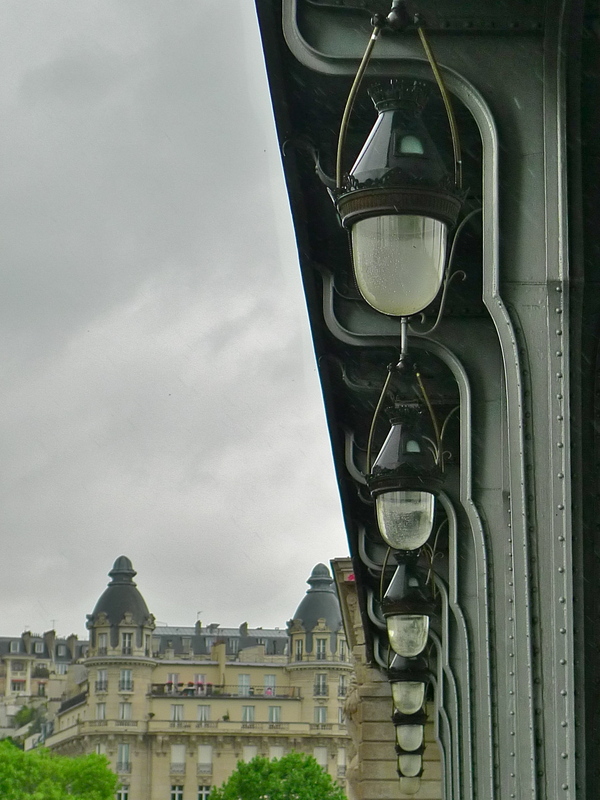 And finally, and nothing at all to do with the sounds of the Pont de Bir-Hakeim, I was captivated by the lamps suspended from the viaduct on this iconic Parisian bridge. * Louis Biette also built the Viaduc d’Austerlitz, a metal viaduct that crosses the Seine in a single span. * Daydé & Pillé also built other bridges in Paris including the Pont de Mirabeau (1896), the Pont Saint-Michel (1890) and the Viaduc du quai de la Rapée (1905). They also built the Grand Palais for the 1900 Universelle Exposition.